There&#146;s a reason New York&#146;s "Hell&#146;s Kitchen" was called by that name, and&#151;to a large degree&#151;that reason is Owen (called "Owney" by his mother and his friends) Madden. Born in Ireland in the late 19th Century, Madden emigrated to the United States with his mother and siblings when he was under ten years old, and became, arguably, the most feared New York Irish crime figure of the 20th Century. Michael Walsh&#146;s And All the Saints is a fictionalized "autobiography" of Madden&#146;s rise to influence and power during the Prohibition era of American history. Walsh&#151;the author of six other books&#151;was, for 16 years, the music critic of Time Magazine and now writes opinion pieces for "DuckSEASON," an internet magazine. And All the Saints is his first historical novel. Then it was my turn. I don&#146;t know why it was always my turn last, except that I suppose Ma knew I was smarter than my brother and that when I set my cap for something, I generally did it. I knew that Ma was hoping I&#146;d shoot high, all the way for priest, because the job was steady and the pay was regular. But I&#146;d somethin&#146; else in mind, something better than priest. Something that would combine the toughness of a fighter, like my Da had been, with the cannon-enhanced authority of the cop and suasion of the padre, although morality had nothing to do with it. Young gangster Madden immediately comes under the influence and protection of Monk Eastman, a Jewish gang leader, commits his first murder while in his teens and grows into notoriety in his twenties. Prohibition provides an opportunity for Madden to increase his territory and wealth, and as a result of his bootlegging activities, he founds the Cotton Club&#151;the swankiest nightclub of its kind in New York. Interested in theater and music, Madden gives Duke Ellington his start at the Club, produces Broadway shows for Mae West, and helps his childhood friend, George Raft, get a start in the movies. One of the princes of the gangland in the 30s and 40s, he ends up in retirement in Hot Springs, Arkansas, telling the story from the point of view of a 73-year-old man anticipating death. 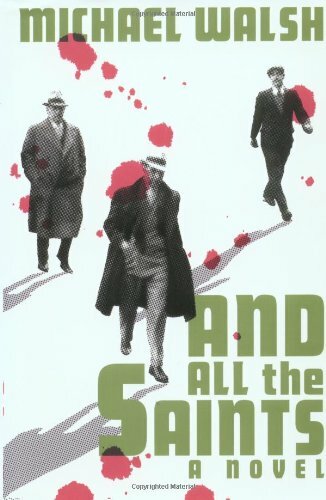 And All the Saints is as tough a book as its narrator was a gangster. It&#146;s a genre book–a true-crime "man&#146;s man" book. Much of the writing is graceful, the plot line is quick and eventful, and the well-researched period detail excellent, but the tough-guy patois that propels the book is, at times, awkward and tedious to follow..